A Queensland mayor has been arrested and charged with official misconduct and computer hacking by the state's corruption watchdog. Fraser Coast Regional Council Mayor Chris Loft was arrested on Thursday afternoon. The Crime and Corruption Commission (CCC) has charged the 66-year-old with two counts of misconduct in relation to public office and one of computer hacking. He has also been charged with disclosure of official secrets and wilfully disclosing information. The CCC said the alleged offences happened while he was Mayor. Cr Loft is due to appear in the Magistrates Court in Hervey Bay in January. Council chief executive Ken Diehm said the Mayor would retain his position unless he, or Queensland's Local Government Minister, decided otherwise. Cr Loft was elected in March 2016. The council takes in the Wide Bay–Burnett cities of Hervey Bay and Maryborough. Fraser Coast Council chief executive officer Ken Diehm said he did not have the authority to ask the Mayor to stand down. "While these charges are quite serious, the Mayor is presumed innocent until proven guilty, until the courts or the minister for local government determine otherwise," Mr Diehm said. "Until the Mayor makes a statement as to what he intends to do, it will remain business as usual." Mr Diehm said the ongoing problems with the Fraser Coast Regional Council were taking a toll. "The ongoing dramas being portrayed in the media are having a negative impact on my staff," he said. "When I took this position I knew that there were challenges with the council. "I didn't expect a CCC investigation and I think the Mayor, the council and the community are looking forward to this investigation coming to an end." Local Government Association of Queensland (LGAQ) chief executive officer Greg Hallam said the charges came as a shock. 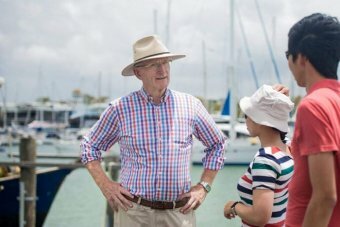 "People have to bear in mind there are 560 elected office members in Queensland … so this is quite unusual," he said. Mr Hallam said Local Government Minister Mark Furner had the power to sack Cr Loft, but not while the Government was in caretaker mode. "There is a presumption of innocence under our legal system," Mr Hallam said. "I don't believe the minister should be acting presumptuously before the court would make the finding of those matters." A spokesman for Mr Furner said "matters concerning Fraser Coast Regional Council are currently being investigated". "It would be inappropriate to comment further given ongoing legal matters," he said.